Johnny Otis discovered Heather Marie in the small northern California town of Sebastopol. She may be young in years, but she shows real maturity when it comes to musical styles and tastes. Listen to what happens when she joins forces with legendary band leader Johnny Otis, who had his first hit records many years before she was born. In producing this album, Johnny applies some wonderful arrangements to some old favorites, as well as adding some of his new songs to the mix. 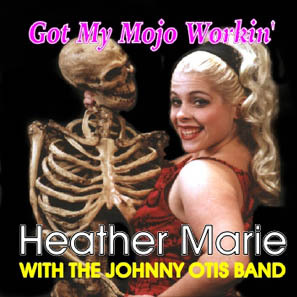 The Johnny Otis Band is the perfect vehicle to display Heather's many talents. This record is a first look at a dynamic young singer who is sure to be around for a long time.